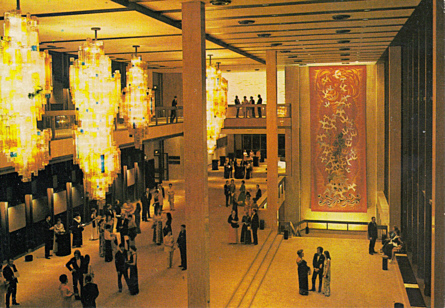 Performing arts centre, opened 1971 with Léo Delibes' ballet "Sylvia". Originally named "Nico Malan Theatre Centre"/"Nico Malan Skouburg" in honour of the South African politician, Nico Malan (1903-1981). 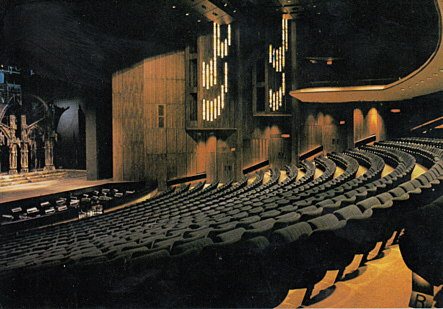 2001 renamed "Artscape Theatre Centre"/"Kunstekaap-Teatersentrum". The complex includes threee halls: Opera House (1487 seats), Theatre (540 seats) and Arena Theatre (140 seats). Reverse Text: "Nico Malan Skouburg / Theatre Centre / Kaapstad / Cape Town - Part of the Opera House auditorium and stage - 'n Deel van die ouditorium en verhoog van die Operahuis"
Reverse Text: "Nico Malan Skouburg / Theatre Centre / Kaapstad / Cape Town - Die hoof-foyer van die Operahuis - The main foyer of the Opera House"